PokerStars has launched a Road to the Bahamas promotion in which hundreds of players will win a package to the PokerStars Caribbean Adventure in January. 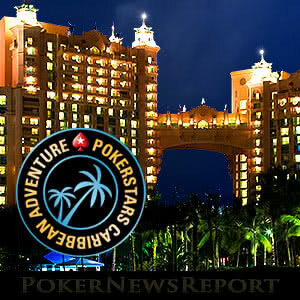 For many players, the PokerStars Caribbean Adventure (PCA) is the annual curtain raiser for the live poker circuit. The event attracts thousands of players from all over the world who are drawn to the Bahamas by the promise of winter sun and quality poker. These include hundreds of recreation players who relish the chance to test their skills against the biggest names in the game. Conscious of the PCA´s appeal to recreational players, PokerStars offers more opportunities to qualify for the PCA than any other live poker event in its calendar. This year, the world´s largest online poker site is aiming to qualify four hundred players for the PCA, and is guaranteeing more than two hundred packages to the PCA Main Event in its Road to the Bahamas promotion. The 2018 PCA will take place at the Atlantis Resort on Paradise Island in the Bahamas from January 6th to January 14th. The thirty-one event schedule is dominated by the $10,300 Main Event, which players can win their buy-in to – plus accommodation at the resort and a contribution towards travel expenses – either directly or via one of two ultra-satellites scheduled for October 15th and November 5th. From this week until November 5th, PokerStars will be including PCA packages and satellite entry tickets among the prizes in the Stars Rewards Chests. The more valuable the chest colour (red being the lowest and platinum being the highest), the higher the frequency of PCA packages among the prizes. Also launched this week is a special PCA edition of PokerStars´ Spin & Go game. The game has a buy-in of $27.50 and will award either a PCA package, a tournament entry ticket for the $530 buy-in ultra-satellites, or PCA satellite tickets valued at $55.00 and $109.00. Special On Demand PCA Sit & Go games have also appeared in the PokerStars lobby. These $55.00 buy-in games get underway when eighteen players have registered, and each guarantees a minimum of two $530.00 tickets to a PCA ultra-satellite. Spin & Go players should check out their Challenges window and opt into the PCA Spin & Go Challenge. This challenge awards points for winning Spin & Go games, and players who earn more than twenty-five points in a week will be entered in a tournament with $50,000 of PCA-related prizes up for grabs. PokerStars is also encouraging cash game players to get involved in the Road to the Bahamas promotion by setting them a different challenge each day. Players who complete the challenge will be entered into an All-In Shootout that awards prizes to a weekly final also with $50,000 of PCA-related prizes. The PCA is a wonderful event and every player has the opportunity to experience it by participating in PokerStars´ Road to the Bahamas promotion. Furthermore, it is not unheard of for an online qualifier to walk away with life-changing cashes. Just ask Canadian player Poorya Nazari who, in 2009, took down the PCA Main Event for $3 million after winning his package in a $33 buy-in satellite. Next January, it could be you. So visit PokerStars today and take your first steps on the Road to the Bahamas.